With information overload becoming a common side effect of trying to keep up with just about anything online, it’s always great to find services and apps which make it easier to fine-tune that information, narrowing it down only to what you want to read. Msgboy can now be added to that list of services. Msgboy comes to us courtesy of the same team behind Superfeedr, a service which makes RSS real-time, by using open protocols. Its long list of clients include Etsy, Tumblr, Fox News, Get Glue, Summify, About.me and more. The team’s latest project, Msbgoy, caters to the consumer by taking bookmarks and Google Reader RSS feeds and turning them into a Web magazine. Using a Chrome extension (with support for other browsers in the works), Msgboy instantly creates a magazine or firehose of your favourite sites and blogs. Once your magazine has been created, Msgboy ‘learns’ what you’re interested in, by allowing you to up-vote and down-vote individual stories, and updating your feed in real-time, so if you’re online, you’ll know the minute a new story has been posted. Social media integration comes in the form of easy sharing to Facebook and Twitter, and you can also save stories to read later using Instapaper. 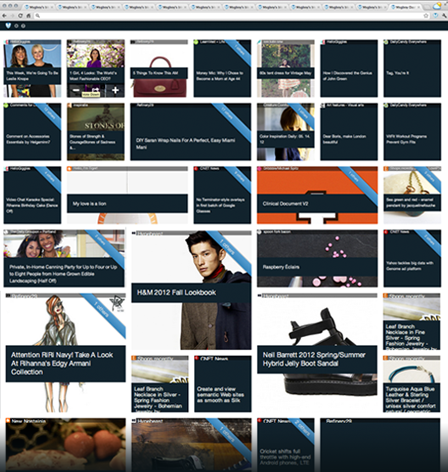 Stories can be read by opening up them in a new tab on the original site. To get the most out of Msgboy, you might want to clean up your feeds and bookmarks before you join the service. I use my bookmarks in something of a haphazard way and so found myself left with quite the cleaning job – luckily Msgboy gives you a way to unsubscribe from sites or feeds through its settings. You should also be warned, any stories that are imported when you first set up your feeds can only be removed by down-voting them, not by unsubscribing from the source. Msgboy is entering a crowded space of apps that aim to offer their users content tailored to suit their taste, but most of them are mobile, such as the popular iPhone/iPad/Android app Zite. By sitting comfortably in your browser, with the ability to add new sources at the click of a button, Msgboy is jumping in where others haven’t, despite a clear demand for desktop access. In our experience, Msgboy does still have a few glitches to work out – for example, images thumbnails weren’t showing up for all sources – but the service is certainly full of potential. Who doesn’t like a service which creates content collated specifically for you?